HOW DID IT ALL BEGIN FOR MR BENN? Since The Insurance Emporium first opened its doors in 2017, there’s been a lot going on. Not only is it a unique way to protect the things in life you love but it’s the new home of childhood favourite Mr Benn. The Insurance Emporium has allowed Mr Benn, and his friend Eddie the dog, to explore a whole new world of adventures. Each time they pass through the door of the Emporium, they are greeted by the Shopkeeper and given a new costume that magically transports them to a new exciting adventure. They’ve been trekking through the jungle together and have even climbed to the top of a volcano to play golf! But Mr Benn’s adventures date way back to before Eddie was on the scene. 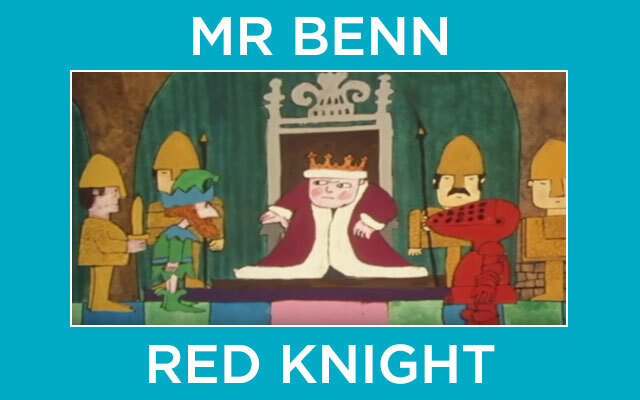 Have a look below for the very first televised appearance of Mr Benn, as well as finding out some fascinating facts about the magical chap in the bowler hat! It was an ordinary Saturday morning in Festive Road and Mr Benn received an invitation to a fancy dress party. Determined to find something special to wear, Mr Benn sets off around the shops but to no avail. Finally, he finds a little shop with all kinds of fancy dress costumes in it. Greeted by the Shopkeeper, Mr Benn is encouraged to try on a red suit of armour and, when he does, he finds himself magically transported to a different land. Exploring this new world, Mr Benn encounters a downhearted dragon who has been exiled by the king of a castle. Determined to help the creature, Mr Benn discovers that the dragon has been set up by a wicked matchmaker. The dragon used to be responsible for lighting all of the fires in the land but the matchmaker wanted to make money, so he set fire to a couple of buildings and made sure the dragon got the blame. Mr Benn travels to the castle and tells the king the truth, who is delighted to pardon the dragon and imprison the matchmaker for his crimes. At a celebratory feast in the castle, Mr Benn bumps into the Shopkeeper who shows him the doorway back to the real world and promises him plenty more adventures in the future! 1. The first episode of Mr Benn aired on the BBC on 25th February 1971 but the first book, written by David McKee, was published four years before. 2. Ray Brooks, who provided the voiceover for every original episode of Mr Benn, also appeared in Eastenders as Joe Macer, the murderous husband of Pauline Fowler. 3. Red Knight was made using a form of stop motion animation. In the words of McKee “Mr Benn largely relied on simple camera movements…across detailed drawings I made”. 4. In Red Knight, Mr Benn wears a pair of smart black trousers but now, when he visits The Insurance Emporium, he’s upgraded to a pair of snazzy pinstripe blue slacks! 5. Mr Benn gains the trust of the king in Red Knight by returning his favourite white horse to the castle. The world is a playground and Mr Benn loves playing life’s games. To catch up with his adventures, old and new, just visit The Insurance Emporium Youtube page and you’ll find them there…as if by magic!